Our team of fine arts shippers proudly works with the Rhode Island School of Design Museum in Providence, the Hyde Collection in Glens Falls, the Museum of the State University of New York at Stony Brook, and many other art museums in the US. We offer comprehensive museum services that include everything from art packing and crating to installation and fine art shipping services. Besides, since Fine Art Shippers is an international art logistics company, we successfully operate worldwide, providing our clients with high-quality exhibit transportation services of any level of complexity. It is also worth noting that we frequently visit many art museums in the US and abroad, and now we want to tell you about one of them. The Walters Art Museum is indeed a must-visit place, highly recommended by our team of fine arts shippers! The Walters Art Museum is a public art museum opened in 1934. Located right in the heart of Baltimore, MD, it is housed in several historic buildings renovated to accommodate a truly exceptional collection of art. For today, the Walters Art Museum is home to approximately 36,000 unique objects from around the world, including art of the ancient Americas, Islamic and Asian art, medieval European art, Renaissance and Baroque art, and more. What is no less important, the Walters is free for all, so don’t miss a chance to visit this beautiful art museum in Baltimore! 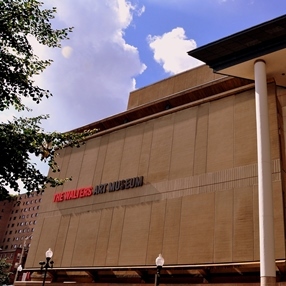 As for our team of fine arts shippers, we definitely look forward to working with the Walters Art Museum too!